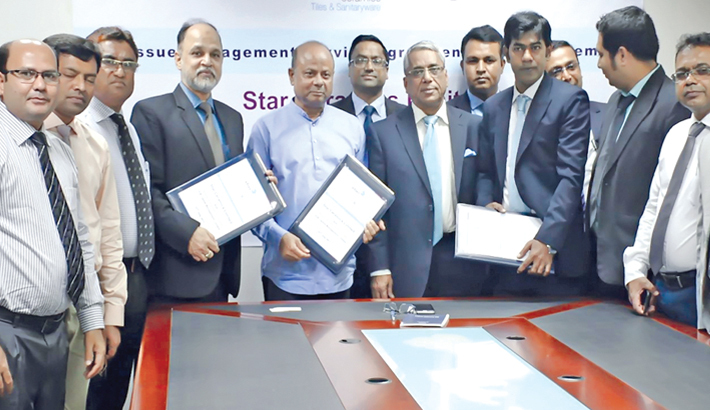 Star Ceramics Managing Director Syed AK Anwaruzzaman and Roots Investment Managing Director Mohammad Sarwar Hossain are seen at an agreement signing ceremony at the corporate office of Star Ceramics in the capital recently. Country’s leading tiles and sanitary ware manufacturing company Star Ceramics has signed an agreement with Roots Investment Limited and ICB Capital Management Limited for issuance of ordinary share of Star Ceramics Limited through Initial Public Offering (IPO) recently. Syed AK Anwaruzzaman, Managing Director, Star Ceramics Limited, Mohammad Sarwar Hossain, Managing Director, Roots Investment Limited has signed the agreement on behalf of their respective organisations.